Bacchus Marsh is a rural centre and regional locality in Victoria, Australia located approximately 57km north west of the state capital Melbourne and 15km west of Melton at a near equidistance to the major cities of Melbourne, Ballarat and Geelong. You'll discover tucked-away gems like Adrenaline & Extreme Tours and Paynes Orchards. 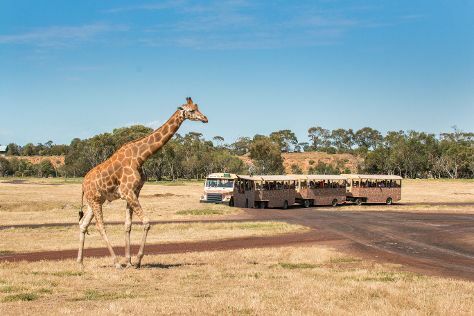 Get out of town with these interesting Bacchus Marsh side-trips: Eynesbury Market (in Eynesbury) and Werribee (Werribee Open Range Zoo, Werribee Park Mansion, & more). And it doesn't end there: look for gifts at St Anne's Winery, explore the activities along Melton Botanic Garden, stroll through Hannah Watts Park, and get a taste of the local shopping with Naturipe Fruits. To find photos, traveler tips, other places to visit, and other tourist information, read our Bacchus Marsh itinerary planner . Portland, USA to Bacchus Marsh is an approximately 23-hour flight. The time zone difference moving from Pacific Standard Time (PST) to Australian Eastern Standard Time (Victoria) (AEST) is 18 hours. While traveling from Portland, expect much warmer days and somewhat warmer nights in Bacchus Marsh, ranging from highs of 79°F to lows of 58°F. Finish up your sightseeing early on the 17th (Sun) so you can travel to Dandenong. Dandenong is a suburb of Melbourne, Victoria, Australia, approximately 30 km south-east from Melbourne's central business district. Eschew the tourist crowds and head to Elwood Beach and Jewish Holocaust Centre. Explore Dandenong's surroundings by going to Bundoora Park (in Bundoora), Brighton Beach (in Brighton) and Islamic Museum of Australia (in Thornbury). The adventure continues: take your sightseeing to a higher altitude at Dandenong Ranges National Park, examine the collection at Scienceworks, stroll through Lysterfield Park, and get the lay of the land with Walking tours. For reviews, photos, and other tourist information, refer to the Dandenong trip planning tool . Drive from Bacchus Marsh to Dandenong in 1.5 hours. In February, daytime highs in Dandenong are 79°F, while nighttime lows are 59°F. Wrap up your sightseeing on the 25th (Mon) early enough to travel back home.